Kesey was born on September 17, 1935, in La Junta, Colorado, and in 1946 he and his family moved to Springfield, Oregon. Kesey attended Stanford University's creative writing program and while there he participated in U.S. Army experiments involving the hallucinagens lysergic acid diethylamide (LSD) and mescalin. At the time he was also working as a nurse's aide in the psychiatric ward of the Menlo Park Veteran's Hospital. Kesey wrote the book that i researched, One Flew over the Cuckoo's Nest, in 1962 along with another book . It was also tuned into a movie in 1975, but kesey refused to watch it, saying that he was unhappy with how it turned out. 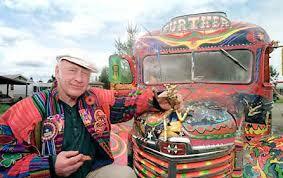 Kesey died, at age 66, in 2001 after surgery to remove a tumor from his liver. "I really wrote it to be as weird as I thought being in the nuthouse was, but it was not what they wanted." - Kesey talking about the movie adaption in 1992.